We are a leading Manufacturer of multi colored lanyards from Mumbai, India. Usage Offices, Schools/College, Seminar, etc. 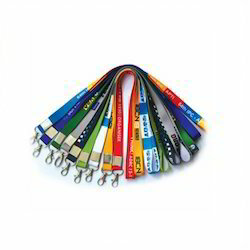 Clients can purchase from us a wide assortment of Multi Colored Lanyards. Made by using high-quality raw material, our range is reckoned for its durability and easy wearing. We offer our range in numerous vibrant colors, innovative designs, and attractive patterns at par with clients' choices & preferences.